Summer is a notoriously bad season for video games. Although this year has a few exceptions (Deus Ex: Human Revolution, The Last Story and Bodycount) the next couple of months are inevitably going to drag. Luckily Steam has got your back, discounting dozens of titles in a rather special summer event. 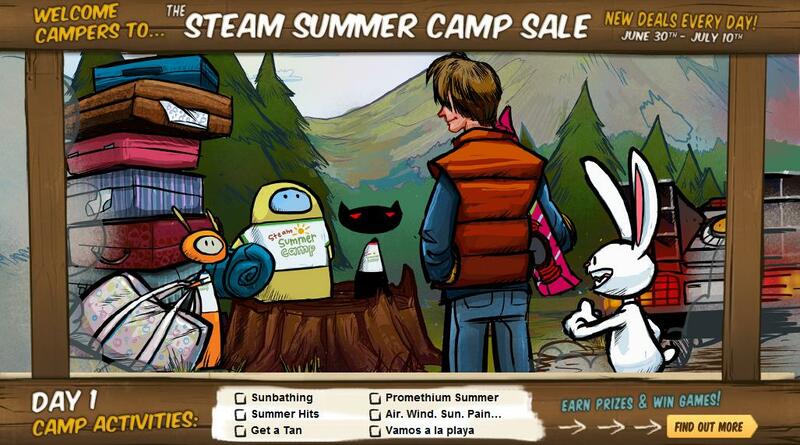 The Steam Summer Camp Sale started yesterday and will run until July 10th. In the meantime you can purchase a selection games at startlingly low prices, emphasised by daily deals that aim to be knock off even more dosh. Steam users can also participate in camp ‘activities’, a special set of achievements that can be traded in for in-game items. It all sounds rather exciting and encourages players (especially school kids that will soon be on holiday) to purchase and play a variety of games. So what are you waiting for? Check out the sale here. 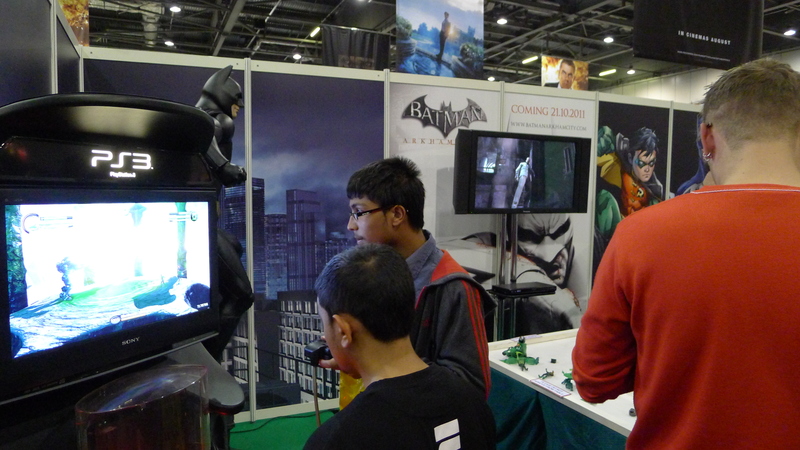 This weekend the London Excel Centre is taken over by MCM Expo, a bi-annual celebration of comics, movies and video games. I’ve been lucky enough to win a weekend pass courtesy of GameSpot UK (thank you very much! ), so I thought I better jot down some of the games that I’m most excited about seeing. 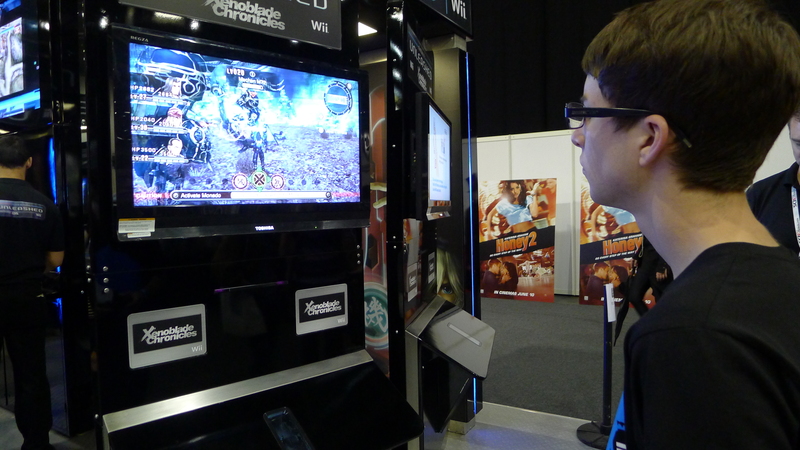 Before GameSpot UK announced their stage schedule for the show, I’d never heard of Okabu. This delightful little puzzle adventurer allows players to take control of various clouds, directing local tribesmen in a bid to save their land from industrialists. The cel-shaded visuals take inspiration from Wind Waker, combining them with tribal music to create a fun, original presentation style. 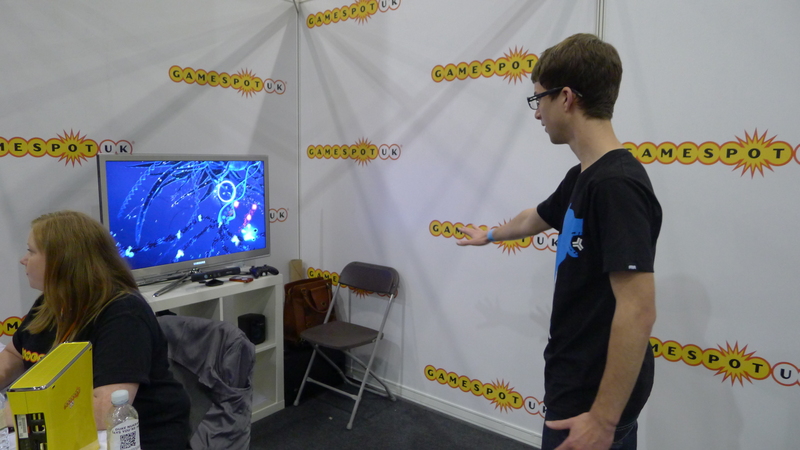 Set for release some time in 2011, HandCircus will be at the MCM Expo for a Q&A session on Friday afternoon. Child of Eden is the most anticipated title for Kinect. Period. 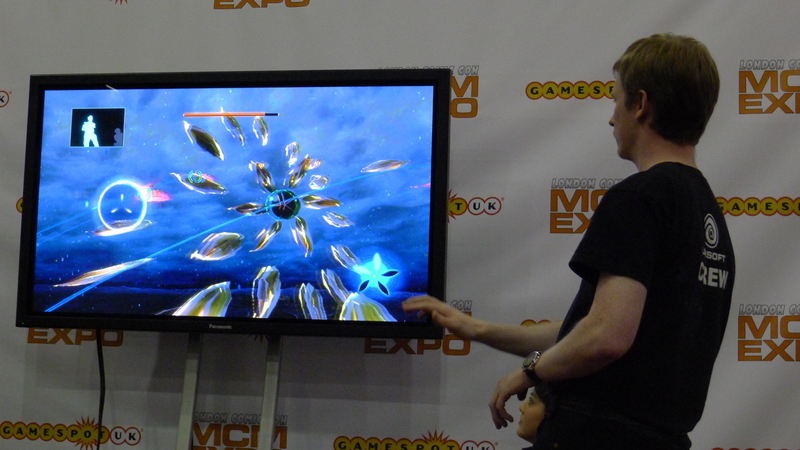 The blend of direct cursor control, eclectic music and vibrant visuals has grabbed the attention of gamers worldwide. Designed by the creator of Rez and Lumines (Tetsuya Mizuguchi), there are understandably high expectations for this intriguing hybrid of rhythm and action game. If you’ve got plenty of questions, ask them at the Q&A session on Saturday afternoon. 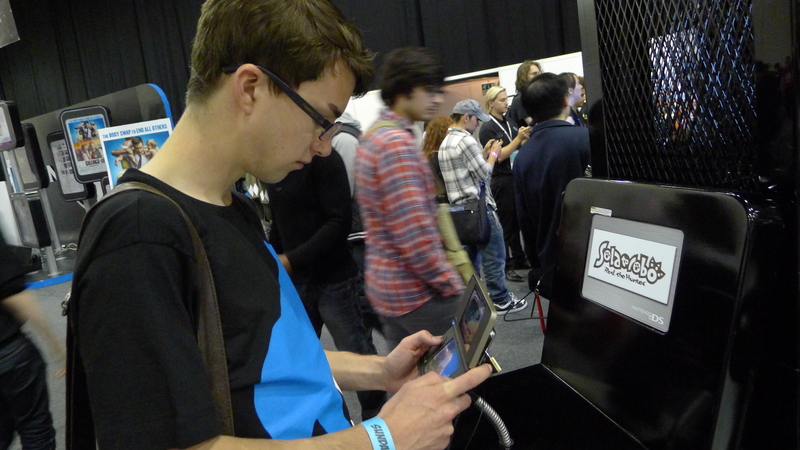 Oh, and you can also go hands on with it at the GameSpot stall. I love cyberpunk. I also love most of Square Enix’s output. Therefore Deus Ex seems like my perfect release, throwing a hero with prosthetic arms into a world on the brink of nanotechnological breakthrough. Players can upgrade their mechanical implants to improve their combat, stealth and social skills, thereby allowing multiple approaches to a single level. 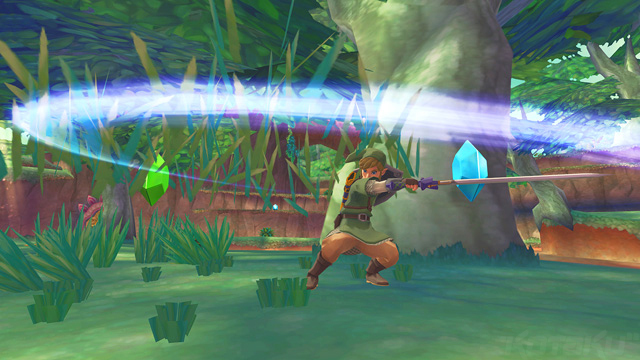 Impressively, it is said that these alterations can even allow a player to finish the game by killing only the boss characters. The art direction looks stunning on this title, but I’m sceptical to see if the gameplay can match it. Look out for the Q&A sessions on Saturday and Sunday. Anything that Suda 51 is involved in is mental. Absolutely and unashamedly mental. This latest concoction pairs the creative genius with Shinji Mikami (the guy behind Resident Evil) in a demon hunting action thriller. The dialogue is hilarious, the graphics are vulgar and the gameplay outright violent. Expect doors to be barred by demons’ pubic hair, a giant Minotaur to fire his number two’s all over you and a barbaric main character. I’m almost certain I’m not going to like this game, but feel it needs to be experienced all the same. 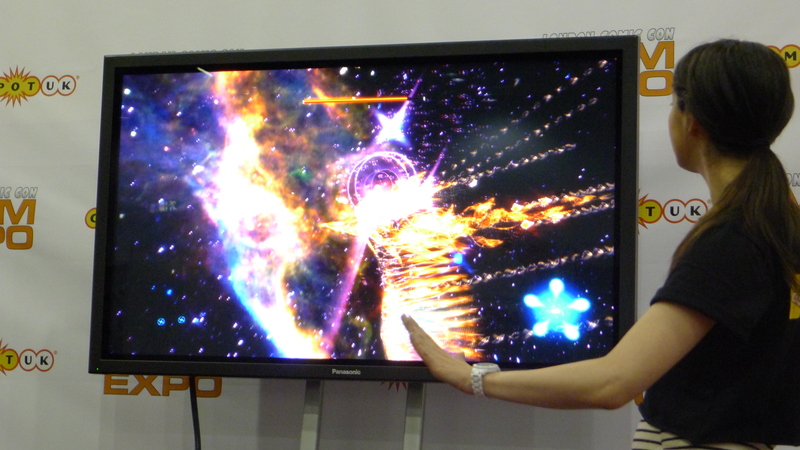 Expect to go hands on with it at the GameSpot stall. So that’s pretty much it for me. What are you most looking forward to seeing and playing? Drop your comments below! 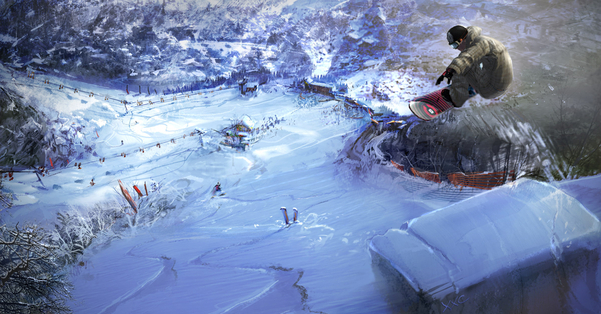 SSX Deadly Descents is renamed as… SSX?! Fans had been dubious and worried since the initial trailer for SSX Deadly Descents dropped earlier in the year. A dark skyline and edgy visuals suggested that the developers were aiming for a more hyper realistic game in line with Stoked or the original Amped games. It looks like the SSX team has taken the fans’ concerns on board and tried to reassure them with this broader description of the game. Creating 70 mountains from scratch will be no easy feat. I absolutely loved the mountain from SSX 3 and would prefer to ride a small number of phenomenal courses than a dozen uninspired ones. Still, EA Canada have had this game in development for some time now – so who knows what kind of snowboarding madness they’ve been brewing. This ‘behind the scenes’ trailer offers some insight into the style and reinvention that they’re aiming for. Racing and insane tricking will be present and accounted for, although this time they’ll be supplemented with the threat of natural disaster. Avalanches and cave-ins were a couple of examples shown in concept art. Todd Batty emphasises staying ‘true to the franchise’ – I really hope that he can deliver on this one. 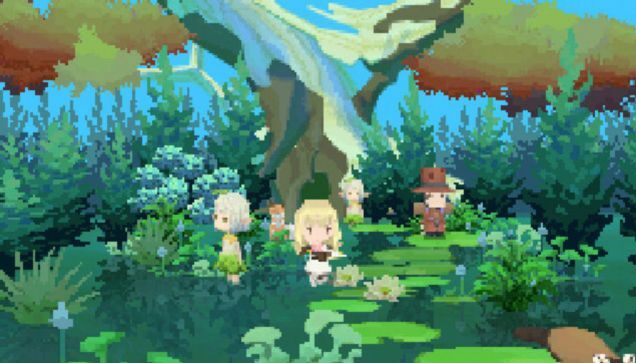 Square Enix tries to recapture the origins of the Final Fantasy franchise in a portable adventure that is both charming and infuriatingly archaic. Followers of the JRPG genre align themselves into two fairly distinct camps. 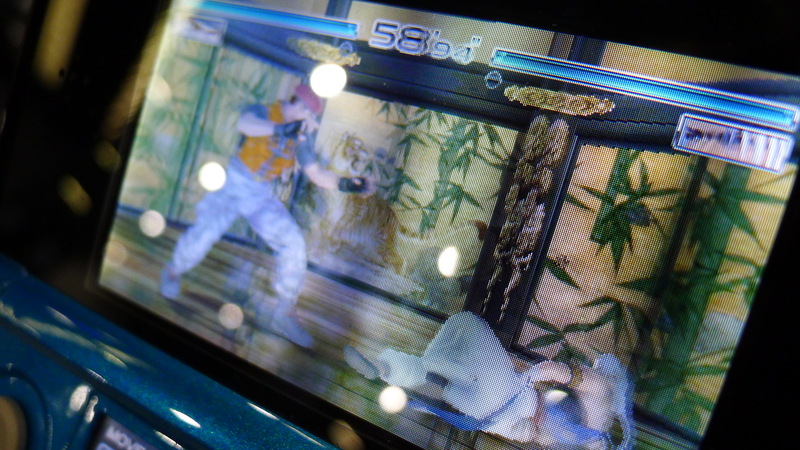 One recognises and embraces the need for evolution, giving recognition for the fresh but often flawed gameplay mechanics in recent titles such as Final Fantasy XIII and Resonance of Fate. The other condemns these failed ideas as the reason for the genre’s recent decline, resisting the trends of linear exploration and emphasis on graphical presentation. They frequently call for a return to the ‘good old days’, where turn based combat was king and random enemy encounters were the norm. Final Fantasy: The 4 Heroes of Light is a game built almost solely for the latter. Everything about it reeks of an adventure that could have been published in the 80s or 90s. Take the plotline for instance; the game surrounds a boy named Brandt, who is summoned by the king to rescue a kidnapped princess. The four other heroes include a spoilt girl from the royal family, a loyal soldier of the kingdom and a reluctant, brooding chap. They’re all purposefully stereotypical and pigeonholed into a journey that is predictable at every turn. Weapons, magic and additional items can all be found and bought in the local villages. Combat is strictly turn based; party members exert varying number of action points (that act like magic of MP) for every physical attack or spell. 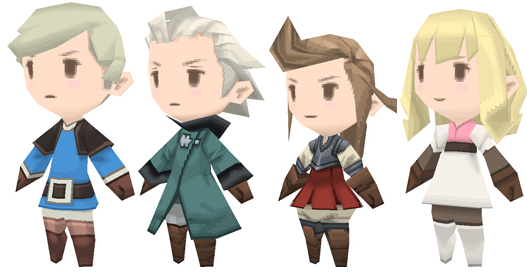 Akin to some of the older Final Fantasy iterations, party members can obtain ‘crowns’ that change their job class as the game progresses. Sound familiar? It should. 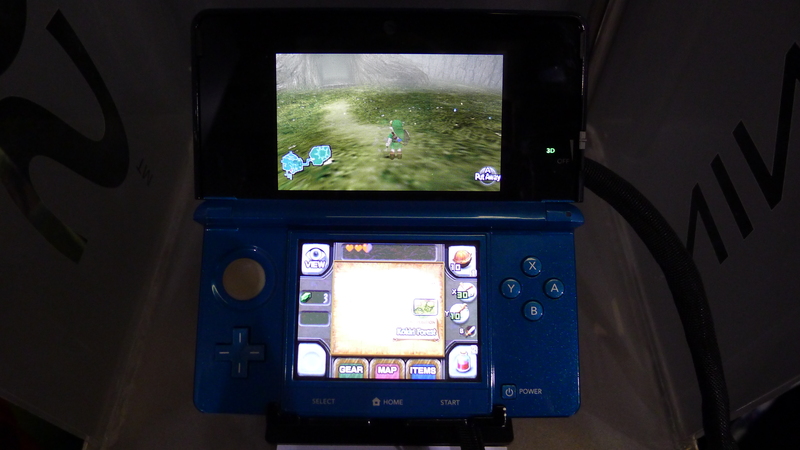 For better and worse, Square Enix has chosen to make this portable experience incredibly traditional. Older players will welcome some of this familiarity in a similar manner to fans of Pokémon or The Legend of Zelda; retreading a well worn path can feel reassuring and comforting in The 4 Heroes of Light. Unfortunately, many of the gripes I have with the JRPG genre have been brought forward as well. In comparison with modern video game standards, it’s very hard to forgive some of the aging design choices. The first is random encounters. One of the advancements that I’ve come to cherish in the RPG genre is the ability to pick and choose my battles. It allows players to grind only when they feel that it’s necessary and conversely push onward when they just want to progress the story. The Persona series and Final Fantasy XII/ XIII are shining examples of this. In my opinion, returning to a random encounter system in Final Fantasy: The 4 Heroes of Light is counter intuitive. It’s irritating to become bogged down in an area with a particularly high encounter rate, increasingly hammering the attack button just to get back to dungeon exploring. Those who argue that grinding is ‘a necessary evil’ are wrong – more often than not, it’s just a cheap way of extending the overall length of the game. The inventory system is also rather baffling. With only 15 slots per character (which include obligatory spell tomes and equipment) I found myself depositing items in the village storage hut with alarming regularity. In the more lengthy and intricate dungeons I found myself having to discard some of the weapons and health tonics that I was picking up; a wasteful and annoying consequence of the system. Variance between dungeons is excellent, but the aesthetics within them are monotonous and dull. 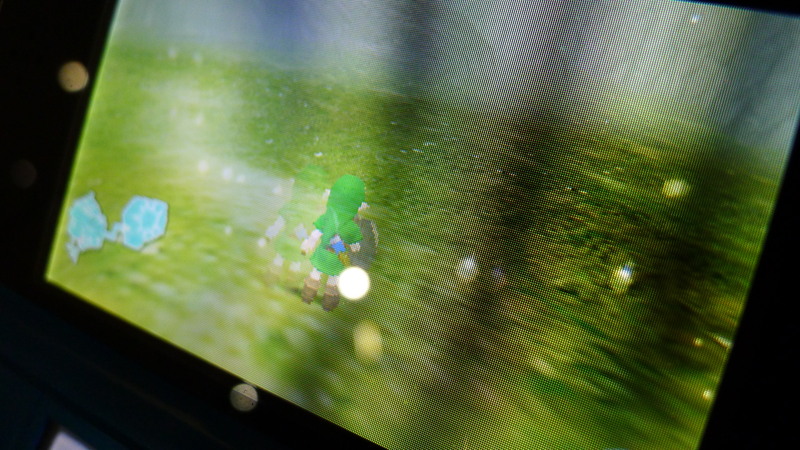 The repetition of textures means that it’s also easy to lose your sense of direction; the absence of a touch screen map (such as the one in the excellent The Legend of Zelda: Spirit Tracks) is sorely missed. The 4 Heroes of Light redeems itself with a fantastic presentation throughout. The 3D engine is very impressive, utilising a picture book aesthetic that has rarely been used elsewhere. Combining a water colour palette and cel-shaded line art, the characters really pop out from the screen and help bring some life to the adventure. The way that party members change their appearance when you swap their equipment is another neat touch. The towns are expansive and occasionally take up multiple levels, filled with interesting houses and townspeople. 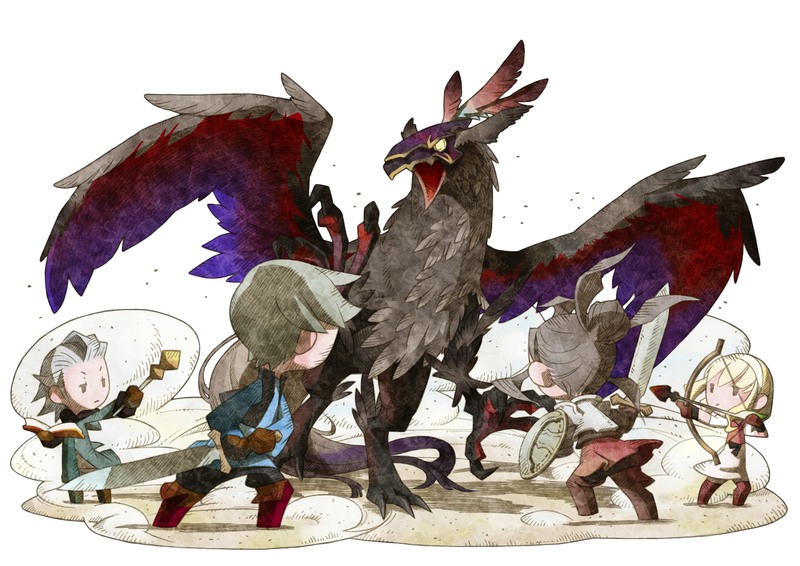 It all adds to the grandeur of a global adventure, something lost in many linear JRPGs. I’ll be honest – I didn’t play this game to completion. Maybe that deducts some of the credibility of this review, but I would argue that I still experienced a thorough representation of the game. If you’re a fan of old-school RPGs, I can recommend this as a solid portable adventure for the Nintendo DS. 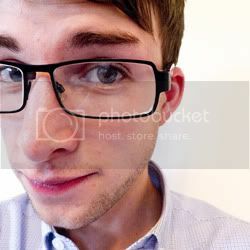 For anyone that champions the recent advancements in the genre, you’re best looking elsewhere. You either love the Gears of War franchise, or you hate it. Both games have never tried to hide what they’re about; a white knuckle-ride pumped with so much testosterone that you hardly notice the absence of a single logical plot point. Brilliant in co-op, both offline and online. Point the analogue stick and shoot alongside Marcus, Dom and the Cole Train. Simple. 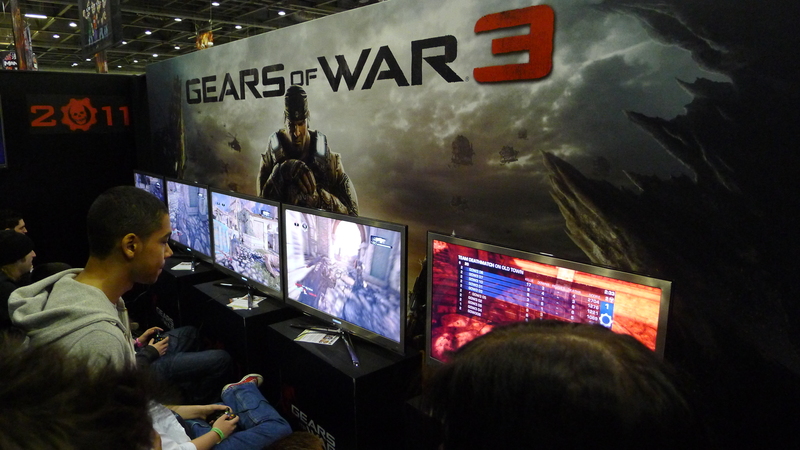 So as you’ve probably gathered from the trailer above, Gears of War 3 has just been announced for April 2011. Not a lot seems to have changed from the visuals or core gameplay, but the atmosphere is a lot, lot darker. It starts with the gripping audio. The song in the background is Heron Blue by Sun Kil Moon, a chilling vocal track layered over an ever looping guitar riff. The motion cap for Dom is as hammy as ever, but when he hits the ground and looks up wearily at the locust (0:30 – 0:45) there’s a genuine sense of weariness and despair. With Maria truly gone, perhaps there is little left for him to fight for. Did I mention how cool his beard looks as well? I like beards. Delta Squad is no longer overrun by masculinity! Anya makes an appearance as a female COG, unleashing hell with her own assault rifle. I’m hoping for some classic brotherhood banter about her inability to drive or carry weaponry properly in the campaign. There were a few hints at a love pairing between Anya and Marcus, but I actually hopes that this emerges as nothing more than courting. 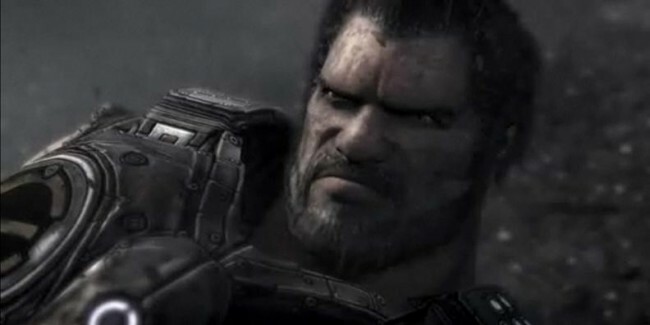 Somehow I just can’t see Epic doing a traditional romance justice in the Gears universe. The new giant Lambent looks interesting enough, but did anyone else notice that some of the locust were shooting at it from the front row? Perhaps this is hinting at some more problems with their inability to control the ranks. 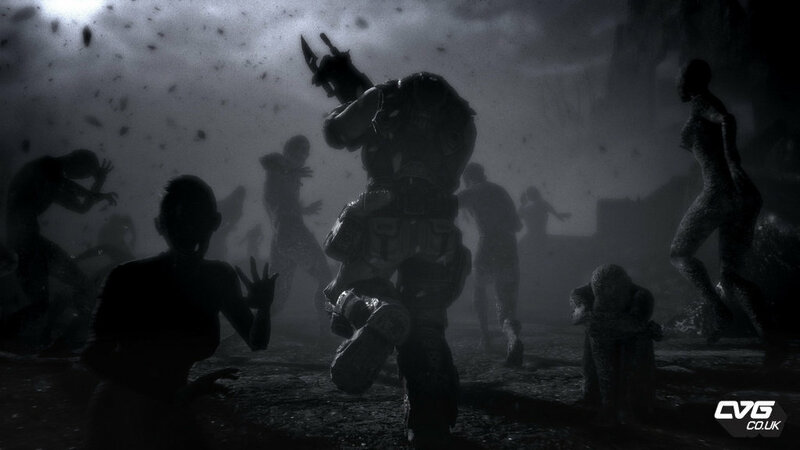 Lastly, the message ‘Brothers To The End’ sends a chilling reminder that this could be the last instalment for Gears of War; or at least with this current set of characters. * The Pendulum Wars. The name on its own sounds epic. What happened and how were Delta Squad involved? * Locust vs Lambent. From the looks of it, the COGs are going to be teaming up with the locust in order to bring down the more formidable Lambent. It’s a very unoriginal plot device, so I’m hoping Epic do something a little more original with it. * Why was Marcus in jail at the start of the first game!? * The emotional toll of the war on Delta Squad. Rather than constant action, I’d like to see some moments where our heroes reflect on the situation and show some of their weaknesses. Dom’s storyline goes someway to fulfilling this at the moment, but Gears of War 3 could truly become a classic if it pulled on the heart strings a little more often.